To you, who gave me these chocolates, thank you for your thoughtfulness and for the brief but memorable moment we had over the dinner (the mosquitoes insisted on joining our party, oh well...it's Jakarta!). 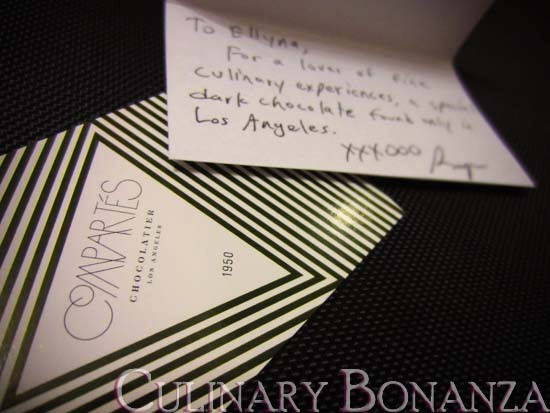 I was told that Compartés is a distinguished chocolatier from the city of lost angels, Los Angeles since 1950. 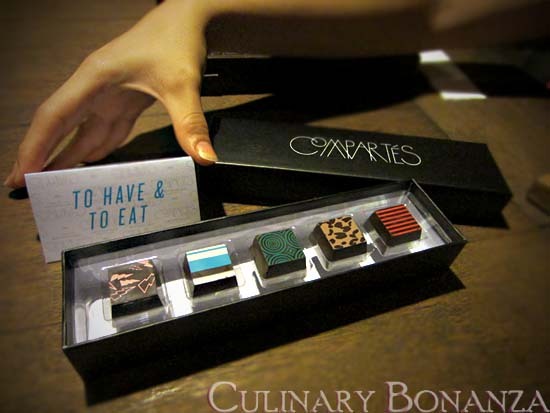 All the goods made by Compartés are handmade daily with ingredients from all over the world. Inside the boxes I received, each pieces of the dark chocolates have different designs, so I reckon they must have different fillings. I went on to the website and went almost breathless, there were so many flavours, from the standard to exotic ones! OMG so lucky! I've heard about them but haven't tried. which one's the best?